Cormac Hogan and I have been working late nights and weekends over the past months to update our vSAN book material. Thanks Cormac, it was once again a pleasure working with you on this project! As you may know, we released two versions of a vSAN based book through VMware Press. The book was titled vSAN Essentials. 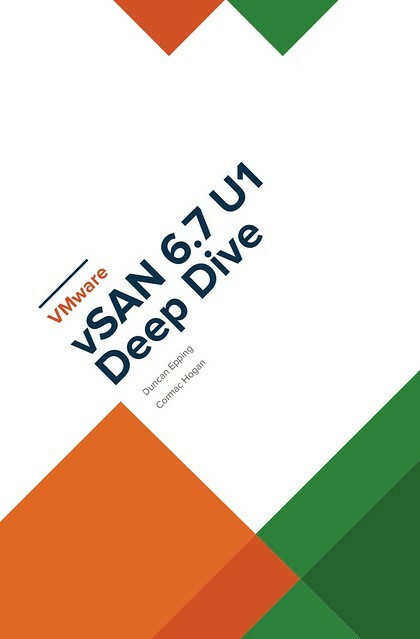 As mentioned before, after restructuring and rewriting a lot of the content we felt that the title of the book didn’t match the content, so we decided to rebrand it to vSAN 6.7 U1 Deep Dive. After receiving very thorough reviews by Frank Denneman and Pete Koehler (Thanks guys!) we managed to complete it this week after we added a great foreword by our business unit’s SVP and General Manager, Yanbing Li. We appreciate all support, but we prefer the cleanest option from an environmental stance, this is also the reason we priced the ebook a lot cheaper than the paper version. Anyway, here are the links to the US store, we hope you enjoy the content, and of course as always an Amazon review would be appreciated! Interestingly, it seems we already reached number 1 in the category Virtualization and the category Storage before this announcement, thanks everyone, we really appreciate it! Match book price – 2.99 USD for the ebook! Many asked us if the ebook would be made available for free again. 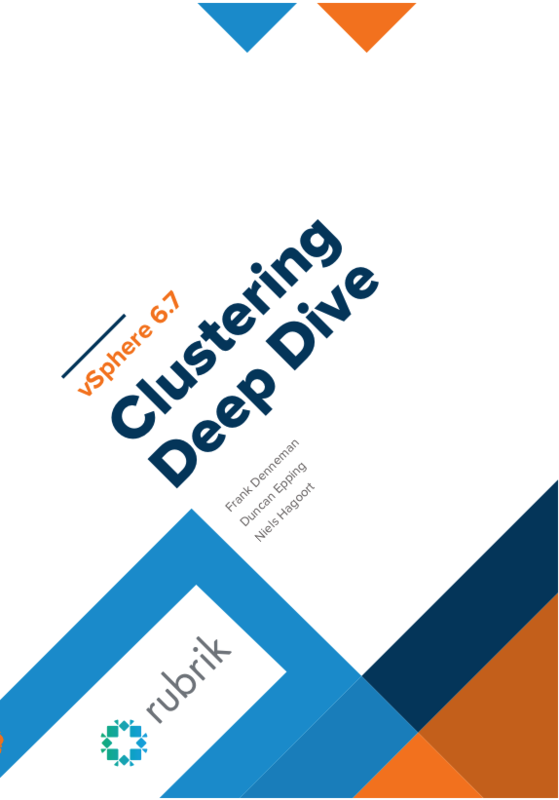 Today I have the pleasure of announcing that Frank, Niels and I have worked once again with Rubrik and the VMUG organization to make the vSphere 6.7 Clustering Deep Dive book available for free! Yes, that is 0 USD / EURO, or whatever your currency is. As the book signing at VMworld was wildly popular, which resulted in the follow up discussion about the ebook. You want a copy? All that we expect you to do is register on Rubrik’s website using your own email address. Anyway, register and start your download engines, pick up a fresh copy of the vSphere Clustering Deep Dive here! Internally some of my focus has been shifting, going forward I will spend more time on edge computing besides vSAN. 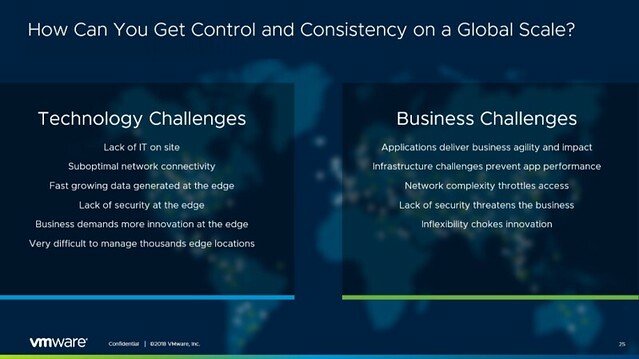 Edge (and IoT for that matter) has had my interest for a while, and when VMware announced an edge project I was intrigued and interested instantly. At VMworld US the edge computing efforts were announced. The name for the effort is Project Dimension. There were several sessions at VMworld, and I would recommend watching those if you are looking for more info then provided below. The session out of which I took most of the below info was IOT2539BE, titled “Project Dimension: the easy button for edge computing” by Esteban Torres and Guru Shashikumar. Expect more content on Project Dimension in the future as I start getting involved more. Now what I found very interesting is that during the session someone asked about the potential for Dimension in on-prem datacenters, and the answer was: “Edge is where we are beginning, but the long-term plan is to offer the same model for data centers as well”. Some may notice that in the above list and diagram NSX is missing, as mentioned during the session, this is being planned for, but preferably will be a “lighter” flavor. What also stands out is that the HCI solution includes not only compute but also networking (switches and SD-WAN appliance). Now, what is most interesting is the management aspect, VMware and the OEM partner will do the full maintenance/lifecycle management for you. This means that if something breaks the OEM will fix it, you as a customer however always contact VMware, single point of contact for everything. If there’s an upgrade then VMware will go through that motion for you. Every edge cluster for instance also has a vCenter Server instance, but you as an administrator/service owner will not be managing that vCenter Server instance, you will be managing the workloads that run in that environment. This to me makes sense, as when you scale out and potentially have hundreds or thousands of locations you don’t want to spend most of your time managing the infra for that, you want to focus on where the company’s revenue is. Now getting back to the maintenance/upgrades. How does this work, how do you know you have sufficient capacity to allow for an upgrade to happen? VMware will also ensure this is possible by doing some form of admission control, which prevents you to claim 100% of the physical resources. Another interesting thing mentioned is that Dimension will allow you to chose when the upgrade or patches will be applied. In most environments maintenance will have an impact on workloads in some shape or form, so by providing blackout dates a peak season/time can be avoided. From a hardware point of view and procurement perspective, this service is also different then you are used to. The services will be on a subscription basis. 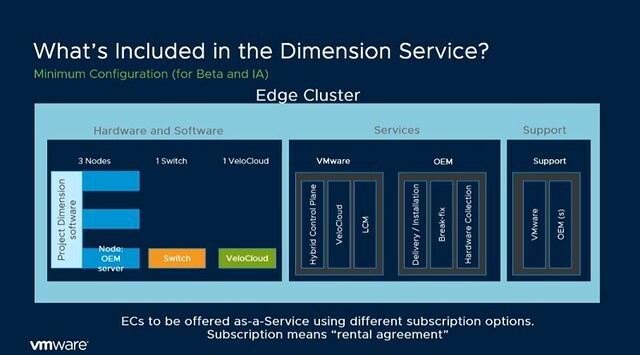 1 year or 3-year reserved edge clusters, or more of course. And from a hardware perspective, it kind of aligns with what you typically see in the cloud: Small, Medium or Large instance. Which then refers to the number of resources you get per node. Starting with 3 nodes, of course, have the ability to scale up and potentially start smaller than 3 nodes in the future. The process in terms of sign up / procurement is displayed in the diagram below, delivery would be within 1-2 weeks, which seems extremely fast to me. What I also found interesting was the mention of a “try and buy” option, you pay for 3 months and if you like it you keep it, and your 3 months contract will go to 1 year (or so) automatically. At this point you may be asking: why is VMware doing this? Well, it is pretty simple: demand and industry changes. We are starting to see a clear trend, more and more workloads are shifting closer to the consumer. This allows our customers to process data faster and more importantly respond faster to the outcome, and of course, take action through machine learning. But the biggest challenge customers have is consistently managing these locations at a global scale, and this is what Project Dimension should solve. This is not just a challenge at the edge, but across edge, on-prem and public cloud if you ask me. There are so many moving parts, various different tools, and interfaces, which just makes things overly complex. 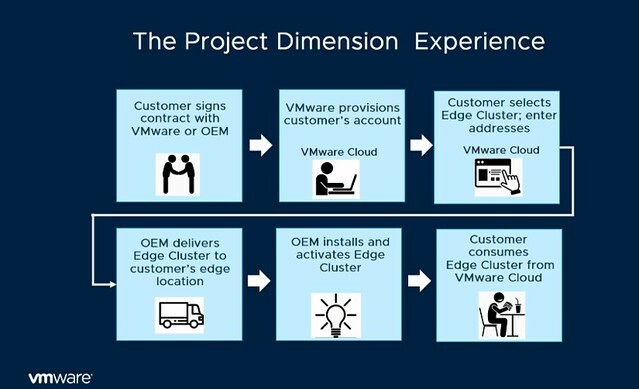 So what is VMware planning on delivering with Project Dimension? Consistently, reliable and secure hyperconverged infrastructure which is managed through a Cloud Control Plane (single pane of glass management for edge environments) and edge-to-cloud connectivity through Velocloud SD-WAN. (Management traffic for now, but “edge to edge” and “edge to on-prem” soon!) There’s a lot of innovation happening at the back-end when it comes to managing and maintaining 1000s of edge locations, but you as a customer are buying simplicity, reliability, and consistency.